Received: June 19, 2018; Revised: July 12, 2018; Accepted: July 13, 2018; Published online: March 15, 2019. Fig. 1. 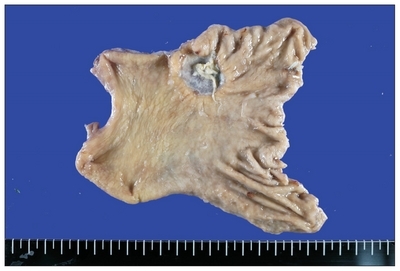 Endoscopic finding showed early gastric cancer, type IIc+IIa lesion on anterior wall of the gastric antrum. Fig. 2. (A) Intraoperative view after dissection of the D1+ lymph node around the hepatoduodenal ligament. (B) Intraoperative view after dissection of the D1+ lymph node around the celiac axis. (C) Intraoperative view of hepatoduodenal ligament that can not distinguish anatomical structures due to very severe adhesions. P = portal vein; AH = anastomosed hepatic artery; CH = common hepatic artery; S = splenic artery; L = divided left gastric artery. Fig. 3. There was a well demarcated, ulcerative lesion (3.0×3.0 cm) in the proximal antrum along the anterior wall. Fig. 4. Post-operative wound after discharge. Previously used Mercedes-Benz incision and trocar insertion site. Nagata Y, Eguchi S, Takatsuki M, et al. 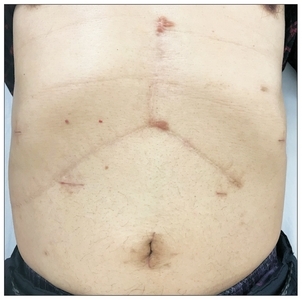 Experience of gastric cancer in a patient who had received a living-donor liver transplantation. Gastric Cancer 2007;10:187-190. Pillai AA. Management of de novo malignancies after liver transplantation. Transplant Rev (Orlando) 2015;29:38-41. Park HW, Hwang S, Ahn CS, et al. De novo malignancies after liver transplantation: incidence comparison with the Korean cancer registry. Transplant Proc 2012;44:802-805. Egeli T, Unek T, Ozbilgin M, et al. De Novo Malignancies After Liver Transplantation: A Single Institution Experience. Exp Clin Transplant 2017 Dec 17 [Epub]. DOI: 10.6002/ect.2017.0111. Burra P, Rodriguez-Castro KI. Neoplastic disease after liver transplantation: Focus on de novo neoplasms. World J Gastroenterol 2015;21:8753-8768. Kim HH, Han SU, Kim MC, et al. Long-term results of laparoscopic gastrectomy for gastric cancer: a large-scale case-control and case-matched Korean multicenter study. J Clin Oncol 2014;32:627-633. Lai Q, Pinheiro RS, Levi Sandri GB, et al. Laparoscopy in Liver Transplantation: The Future has Arrived. HPB Surg 2012;2012 148387. Lee MS, Kim EY, Lee JH, et al. Laparoscopy-assisted distal gastrectomy for gastric cancer after liver transplantation. J Korean Surg Soc 2011;80 Suppl 1:S1-5. Gong CS, Yoo MW, Kim BS, et al. De Novo Gastric Cancer After Liver Transplantation. Ann Transplant 2016;21:386-391. Jung IK, Kim MC, Kim KH, Kwak JY, Jung GJ, Kim HH. Cellular and peritoneal immune response after radical laparoscopy-assisted and open gastrectomy for gastric cancer. J Surg Oncol 2008;98:54-59.